While you’re looking up monuments, museums, restaurants, and other attractions you’d like to see at your destination, take a few minutes to note where other helpful locations nearby your hotel or rental home will be. Locations like grocery stores, pharmacies, and even medical clinics are great to know about prior to arriving, especially if the place your staying at doesn’t have free Wi-Fi. If you don’t have the supplies to appropriately address a dental emergency and you can’t find a dentist, you’ll be glad you took the time to learn. 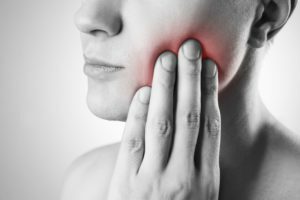 Due to the pressure imbalances that can occur when flying, you may encounter some tooth pain or sensitivity. If the pain doesn’t go away after you land, start by rinsing your mouth out and using floss to dislodge any food debris that may be present. If the aching pain doesn’t go away, take some painkillers like Advil or Motrin to alleviate it. Avoid chewing on that side of your mouth until you get back home. If you have a bad fall and a tooth becomes dislodged, you’ll want to find the tooth as quickly as possible. Once found, pick it up by the crown and rinse it. If dirty, you should also try to rinse the root, but avoid removing any tissue fragments that may still be attached. The best way to keep it preserved is to place it back into the socket facing the way it was originally. If not possible, transfer the tooth to a container of milk, saline solution, saltwater, or saliva and ask your hotel concierge or renter if any medical or dental clinics are nearby. If a crown or filling falls out, do your best to locate it. Your tooth is more likely to become infected without protection, so it’s important that you get the restoration back on as soon as possible. Before doing this, rinse it with cool water. Apply clove oil to the affected tooth prior to placement or take pain medications to alleviate any discomfort you’re feeling. Then, use either dental cement, denture adhesive, or petroleum jelly to adhere the restoration back on. Have more questions on handling a dental emergency in Yakima or while traveling abroad? Schedule an appointment with your dentist today! Dr. Lyle I. Bonny earned his Doctor of Dental Surgery degree from the University of Washington Dental School. He makes every effort to treat dental emergencies effectively and provide helpful information on what to do prior to your visit. If you’re having a dental emergency, contact your emergency dentist in Yakima through his website.